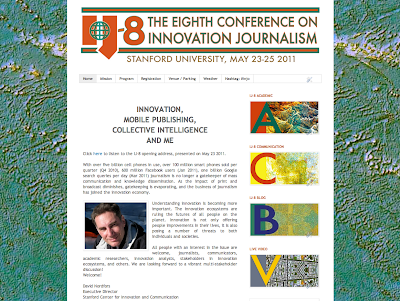 IJ-8 The Eighth Conference on Innovation Journalism was held at Stanford University May 23-25 2011. It featured two tracks apart from the main conference - the Academic track, and the Communications track. The conference materials have since then been available on the conference website. They can as from now also be referred to through the Innovation Journalism Publication Series. With over five billion cell phones in use, over 100 million smart phones sold per quarter (Q4 2010), 600 million Facebook users (Jan 2011), one billion Google search queries per day (Mar 2011) journalism is no longer a gatekeeper of mass communication and knowledge dissemination. As the impact of print and broadcast diminishes, gatekeeping is evaporating, and the business of journalism has joined the innovation economy. Understanding innovation is becoming more important. The innovation ecosystems are ruling the futures of all people on the planet. Innovation is not only offering people improvements in their lives, it is also posing a number of threats to both individuals and societies. All people with an interest in the issue are welcome, journalists, communicators, academic researchers, innovation analysts, stakeholders in innovation ecosystems, and others. Click here to listen to the IJ-8 opening address, presented on May 23 2011.